New dad, Ahmed Musa moved from Leicester City to Al-Nassr. 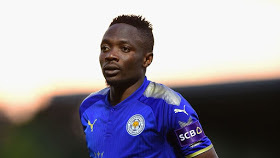 Musa, was the Foxes record when he joined King Power for 16.6 million pounds in 2016, but he failed to retain his place and was loaned to his former club, CSKA Moscow, part of last season. The Nigerian international has found the net six times in 10 appearances to the Russian club, three times more than in his 21 Premier League matches. He scored twice at the World Cup, with both goals coming against Iceland in Group D clash. Al-Nassr said he signed a four-year contract but did not disclose the transfer fee.